Manifested Dreams: The grand entrance of the PuffPuff family! So my knuckles were sore today from all the crocheting I've been doing. With Nekocon coming up I really can't afford to be all slacker like. So I whipped out the felt I got at Pat Catan's and went to work. 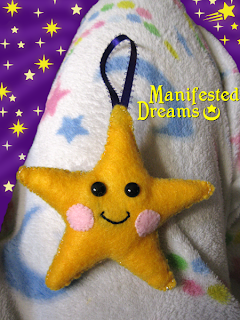 The result is the second mascot of Manifested Dreams, Starchan Puffpuff! This is the prototype. I intend to alter it slightly, making her a little wider (I think). Currently it's roughly 5 inches tall and 5 inches wide, 1 inch thick. I may add about an inch(and get the boyfriend to work on a proper, vectored patter!) to make it a bit more puffy looking. Starchan and the other Puffpuff members will be available on my website in the coming months. Their sizes make the Puffpuffs perfect ornaments for trees. Starchan will be available as a tree topper as well. I'm hoping to have a special give-away ready before Christmas, more details on that front as I figure it out! Another idea I have is to fill some of them with lavender to be used as sachets, thoughts? I don't want to spread myself too thin but as far as sachets go, it's just one more quick step. Anyways, that's it from me for now. Hope you all had a good day! Aww - cute! I'm all about the lavender - I think there can never be enough - but Starchan is adorable either way! I'm right there with you Rue! I looove lavender. It's a very relaxing and soothing scent. I agree Starchan is darling and lavender is a wonderful idea.